Rugby Support Catching The aim of the drill is to develop a high ball over head catch with a support player behind to catch anything over head. Up to 10 in a group. Each player should have a tag belt. Each player partners up with someone and then stand side by side. 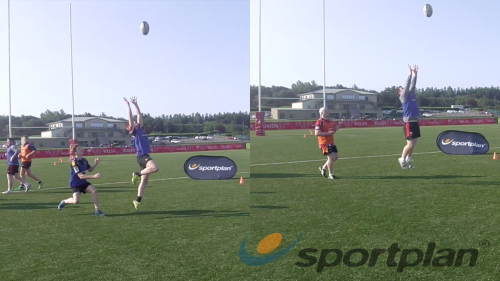 Drill to practice kicking accuracy and contesting the ball in the air. Players take it in turns to throw a high pass to one another. 5 high catches each and then swap roles. 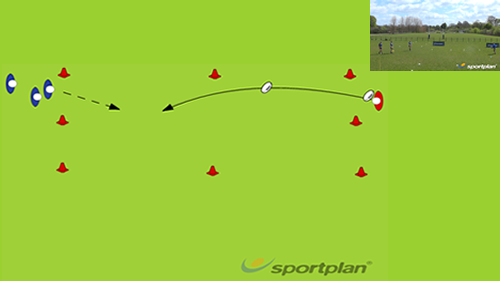 Player A throws or kicks a high ball for player B to catch by taking steps to meet the ball. 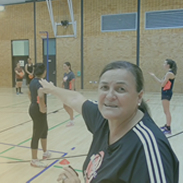 Player A throws or kicks a high ball for player B to catch in a stationary position. This could be perfect fro a warm up drill. Players stand around a coach holding ball. 2 teams, 1 ball with 2 grids diagonally across from each other. Each team is made out of 3 pairs and one float support player. 5 players working with 1 ball in a grid 20 by 20 meters, working on their grubber kicks and punts. 7-man lineout; throw to 2; lift, catch, drive. 7-man line; throw to 2; lift, catch drive. Players work in pairs with 1 ball. Strong grip, thumbs are out, hold the ball high with fingers pointing to the sky. X throws ball up and A must the pass the 2nd ball to X, who catches passes to B. Two teams with one team in the middle. Hold the ball between your legs, one hand behind, one hand in fornt. One of your players will be the passer, and the other the catcher. Throw the ball straight up into the air above the head. Twist 180o quickly to face in opposite direction and catch the ball. Spin pass for a 14-year old boy?